A 17-year-old boy has been stabbed to death in Greater Manchester . 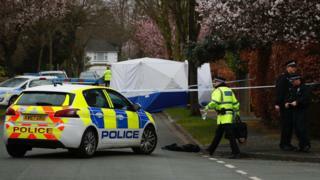 Police found the teenager in Gorse Bank Road in the affluent suburb of Hale Barns at about 18:40 GMT on Saturday. He was taken to hospital where he died. Two boys, also aged 17, have been arrested on suspicion of murder and remain in police custody for questioning. Officers appealed for information and said there would be extra patrols in the area. Supt Marcus Noden said: “We have been speaking to people living on the road as part of our immediate inquiries and we will continue to do so over into Sunday. The death comes a day after a 17-year-old girl, Jodie Chesney, was killed in a knife attack in a London park.